It should not be confused with golden samphire (Inula crithmoides) a member of the daisy family (Asteraceae). Other Common Names: Samphire, sea samphire, sea fennel, rock fennel, crest marine, hinojo marino (Spanish), fenouil de mer (French), Meerfenchel (German), søfennikel (Danish), sanktpeterskjerm (Norwegian), saltmärke (Swedish). 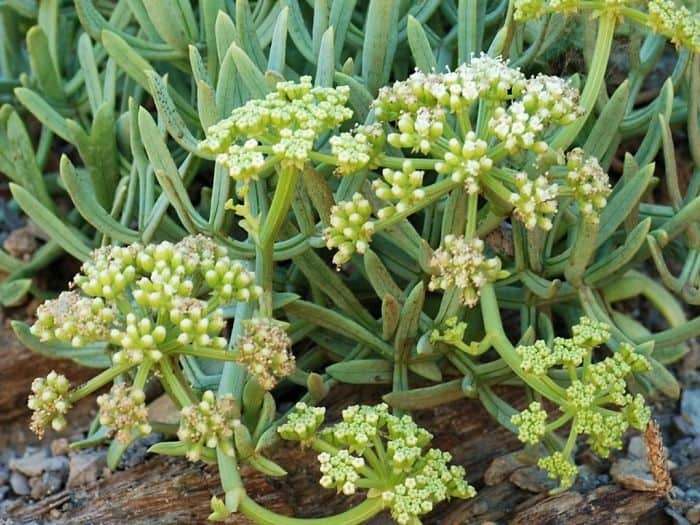 Habitat: Rock samphire can be found around the Mediterranean and the Black Sea, and along the Atlantic coast from the Canary Islands to northern France. The plant grows also along the west and south coast of Britain and Ireland. In recent years the species has spread and can now be found in the Netherlands, Belgium and even as far north as Norway. Its preferred habitat is rock crevices, cliffs, rocky shores and sometimes along shingle beaches. It grows best in sandy, well-drained soil. The plant does not tolerate shade and grows best in full sun. Description: Rock samphire is the only species in the Genus Crithmum and belongs to the carrot or parsley family (Apiaceae). It is a perennial, succulent plant that reaches 10-30 cm in height. The plant is smooth and richly branched with a stalk that is hard and woody at the base. The leaves are 2-3 times pinnate with linear to oblong, fleshy lobes. The hermaphrodite (have both male and female organs) flowers are greenish-yellow. The plant is in flower from July to August. It is pollinated by insects and it is self-fertile. The seeds are 3-5 mm long, ovoid or oblong, yellowish to purple and with ribs. The seeds ripen from August to October. Plant Parts Used: The above ground parts of the plant are used as food and herbal medicine. In spring, the young leaves and flowers can be collected from plants in good growth and used in salads or as vegetables. Active Ingredients and Substances: The plant contains vitamin C (ascorbic acid and dehydroascorbic acid), polyacetylenes (including falcarinol and falcarindiol), flavonoids (diosmin), furanocoumarins, pectin, and the minerals zinc, iron, magnesium, iodine, and sulfates. In addition, the essential oil extracted from the plant contains the substances geranyl acetate, dillapiole, sabin, limonene, thymol methyl ether, and gamma terpinene. 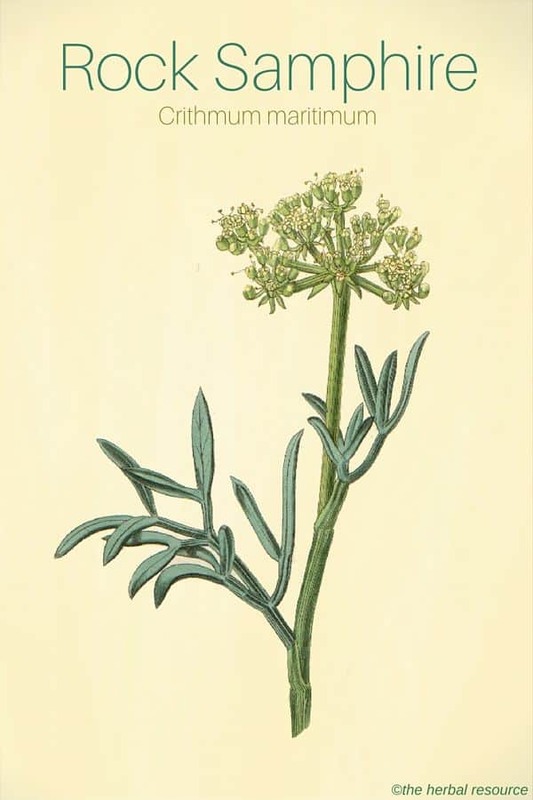 Rock samphire is rarely used in today’s herbal medicine but some herbalists still use it for medicinal purposes and recommend it for a variety of ailments. The herb has diuretic properties and it is regarded as an appetite stimulant. Also, a strong extract made from the plant has been used traditionally as an herbal remedy for intestinal worms. Due to the plant’s high levels of vitamin C, it was once in much demand as a treatment for scurvy. Internally, the herb is usually used fresh, but it can also be used as a tea. The tea has a pleasant, salty and spicy taste, and it is an excellent natural source of vitamin C and flavonoids. Both vitamin C and the flavonoids have antioxidant properties and contribute to the anti-inflammatory and diuretic effect of the herb. Some of the polyacetylenes found in the plant, for example falcarinon, are regarded as natural antibiotics and the positive effect rock samphire has on the digestive and urinary tract system is partly due to some of its antimicrobial properties. The essential oil in the herb is also thought to be good for the digestive system. It may be helpful in reducing intestinal gas production in the same manner as fennel (Foeniculum vulgare). The leaves of the plant have a reputation of being helpful for losing weight and to treat obesity, an effect that can be partly explained by the herb’s content of iodine. Rock samphire is often referred to as a “sea vegetable” and in some coastal areas where people are aware of the plant’s properties and benefits, it is still collected and used in cooking. The plant is considered particularly suitable for many fish and seafood dishes. The succulent leaves and stalks of rock samphire can be boiled or steamed and eaten in the same manner as asparagus. The highly aromatic and salty leaves can also be used fresh in salads. Furthermore, the young leaves, stems, and seeds can be used in pickle making. Very limited information is available on the dosages or the doses of the herb as herbal medicine. It is advisable to contact a knowledgeable herbalist prior to use or self-medication. For commercial products containing the herb in any form, the manufacturer’s instructions should be followed. 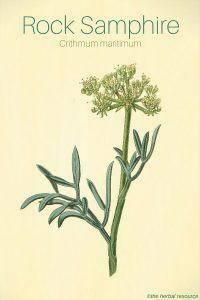 Rock samphire is considered a safe herb to use both as food and herbal medicine. The herb should not be consumed in large amounts during pregnancy. Rock samphire contains furocoumarins that can make some people more sensitive to sunlight (UV light) and causing a reaction known as phytophotodermatitis. Phytophotodermatitis appears only where the skin has been exposed to sunlight, usually within hours after exposure. Barker, Julian: The Medicinal Flora of Britain & Northwestern Europe. Kent, Winter Press 2001. Breverton, Terry: Brevertons Complete Herbal. A book of remarkable plants and their uses. London, Quercus Publishing Plc 2011. Das Prajapati, Narayan, S.S: Purohit, Arun K. Sharna & Tarun Kumar: A Handbook of Medicinal Plants. A Complete Source Book. Jodhpur, India, Agrobios (India) 2012. Williamson, Elisabeth M.: Potter’s Herbal Cyclopedia. Essex, Saffron Walden 2003.